Visit southern Utah for the 15th annual Utah/Arizona ATV Fun Run! Located in the heart of many scenic OHV trails in southern Utah and northern Arizona! Meet many riders from all across the country, who will soon become some of your greatest friends! Once you ride in southern Utah/ northern Arizona, you'll want to come back time and time again not only for the beauty of the area, but the many people you will meet along the way! You'll soon learn that Kanab is the perfect base camp for all of your OHV trails! First Hand: $35.00 Includes free T-shirt or Hat. on the 39-mile fun run course. To pre-register click here for registration form. Raffle tickets for a Henry Golden Boy Rifle $5 and ‘Split the Pot’ Drawing. and lots of the other prizes to be given away. will be based from the Peek A Boo Staging area. Please park trailers along the frontage road to offload OHV’s. No camping at the Staging area. 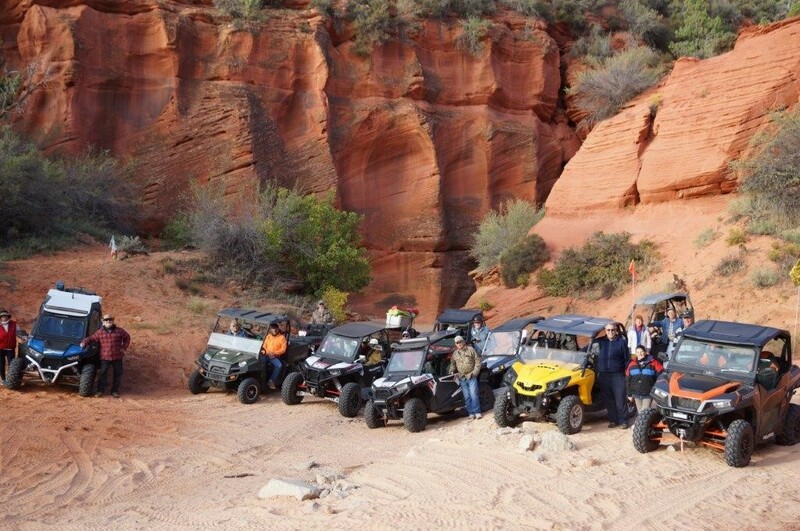 There will be three days of OHV Fun in the Red Rock canyons of Kane County, Utah. Please note that pre-registration waiver is required for all drivers. on Friday and Sunday please sign up at the event registration table prior the events. There will be limited numbers on each ride. Schedule of events: (Check in at the event headquarters at the Peek A Boo staging area, each day). Friday May 4, 2018 (Three Free guided OHV Rides, pre registration required) All times MST. 8:30 am to 9:30 am Pre-Registration for free rides and the Fun Run. 10 am Ride # 1 (For Advanced riders, limited to 20 OHV units). “Our Anasazi Run”. Going to Elephant Butte, via Mt. Carmel, a sandhill climb out, Harris Mtn. Red Knoll. (Bring your lunch). 10 am Ride #2 (For Intermediate Riders, limited to 20 OHV units). Kanab Creek Pinnacles, Brown Canyon Hoodoo’s, below the White Cliffs, mysterious Circle Glyphs, Hidden Lake and return. (Bring your lunch). 12:00 Noon Ride #3 (Easy Ride, 20 riders) Guided ride to and foot tour of the Peek A Boo Slot canyon. 8:30 to 9:30 am Fur Run registration open. Display of all prizes, and raffle open for a Henry Golden Boy .22 Lever Action Rifle at $5 per ticket. 9:30 am Riders line up for departures, for 39-mile Fun Run Trail. 10:00 am Fun Run departures: Procedure; riders deposit their fun run ticket stubs at five stations on the course. (There will be food vendors set up serving hot lunches and cold treats). 2:00 pm (approximately). Drawings and awarding of prizes, assemble at the staging area. Sunday May 6, 2018 (Three Free guided OHV Rides). 10 am Ride #5 (For Intermediate Riders, limited to 20 OHV units). Kanab Creek Pinnacles, Brown Canyon Hoodoo’s, below the White Cliffs, mysterious Circle Glyphs, Hidden Lake and return. (Bring your lunch). 12:00 Noon Ride #6 (Easy Ride, 20 riders) Guided ride to and foot tour of the Peek A Boo Slot canyon. Thank you for visiting https://www.visitsouthernutah.com:443/ATV_Fun_Run_2018! Be sure and revisit visitsouthernutah.com frequently for content updates and more.